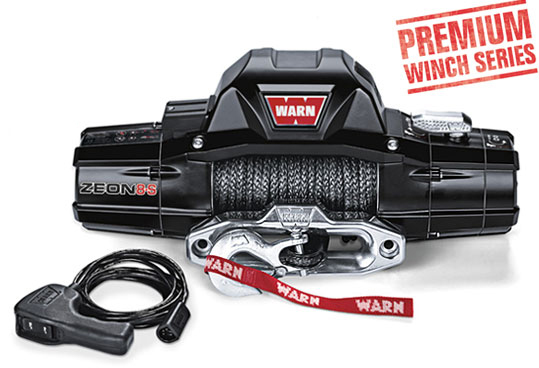 WARN ZEON 8-S premium winch with 3/8 inch on WARN Spydura Synthetic rope, advanced, capable, and strong. Don not let the good looks fool you. We have packed the ZEON 8-S winch with all the performance features off-roaders said they needed most. From a heat-dissipating brake down to an incredibly smooth planetary gear train, this winch is ready to hit the trail. The 8,000 lb. pulling capacity, combined with a fast line speed make this winch the perfect choice for Jeep and SUV trail rigs. Includes 100 ft of 3/8 in WARN Spydura synthetic rope, which includes a temperature-resistant sleeve on the first layer, a ballistic nylon sliding sleeve for abrasion resistance, and a polished aluminum hawse fairlead. Convertible control pack can be attached to the winch or remotely mounted, allowing for various winch mounting options and looks (Relocation kit required and sold separately).